Prioritize network traffic and increase network QoS with CyBlock Bandwidth Management. In the current Internet-connected enterprise, constant and rapid changes require IT to have proactive control over the organization’s bandwidth. Many organizations now allow the use of tools such as DropBox, social media, and streaming, as well as BYOD use for, and during, business operations. The idea is to use these tools for business productivity. But then combine this with any personal use of these tools, or other services, and you have a bandwidth drain on the company network. For an IT administrator, this holds many more challenges in how to make sure priorities are set for bandwidth. With CyBlock’s Bandwidth Management feature, we can help you battle bandwidth hogs, improving your network QoS and keeping your mission-critical operations running smoothly! Posted in Bandwidth Issues, CyBlock, Wave News | Comments Off on Prioritize network traffic and increase network QoS with CyBlock Bandwidth Management. Keep mission-critical applications running smoothly with Bandwidth Management in CyBlock Cloud, including Wavecrest’s exclusive Web content category level throttling or blocking capability. Even with corporate Acceptable Use Policies (AUPs), the majority of an organization’s Web traffic is often operating unchecked, opening the entire network up to bandwidth hogs, productivity-draining activity, and security risks. With Bandwidth Management in CyBlock Cloud, easily create user-defined policies and configure multiple-usage thresholds to dynamically trigger caps. As a business that understands the necessity, or just desirability, of employees’ access to the Internet, do you worry about when there is too much nonessential Web activity? Maybe Facebook or Pandora is clogging your bandwidth? Wavecrest has the solution that can help specifically target and throttle Web content category-based traffic, such as social networking or audio streaming. With Bandwidth Management in CyBlock, gain the ability to allow access, but be more restrictive as the usage gets higher by setting one of your higher usage thresholds to throttle more or completely block nonessential categories or user groups. Set e-mail alerts to keep you informed wherever you are, knowing that your defined policies are automatically triggered and proactively taking care of the issue. Once a policy is activated, policy-specific traffic is throttled or blocked, allowing business-critical applications (VoIP, CRM, etc.) to continue operating as needed. Now including Bandwidth Management, CyBlock Cloud provides comprehensive Web controls, threat protection, reporting, simplified management, and more — all in a deployment requiring no hardware or software to buy and install, and no maintenance. We’re excited to announce that some new enhancements have been added to the latest versions of CyBlock and Cyfin. You asked and we listened! Included in these enhancements are filtering by thirty-minute increments instead of hourly (CyBlock only), real-time bandwidth monitoring (Proxy and Appliance only), and the ability to email user audit detail reports to individual users. Below is a full list of enhancements added to the latest CyBlock and Cyfin releases. Filtering by Half Hour (CyBlock Only). Web categories can now be filtered by half hour increments instead of hourly. OtherWise. We have made it easier to participate in our OtherWise program to optimize your categorization results. You can participate in OtherWise by simply going to the Setup – Otherwise screen, select Enable and Submit. Email Report(s) to Individual User(s). Email addresses can now be applied to individual IDs in Groups and IDs, and as a result, an option to “Email Report(s) to Individual User(s)” has been added to audit detail reports. Real-Time Bandwidth Monitor (Proxy and Appliance Only). This new monitor displays the top users based on bandwidth consumption in real time and automatically updates every 10 seconds. 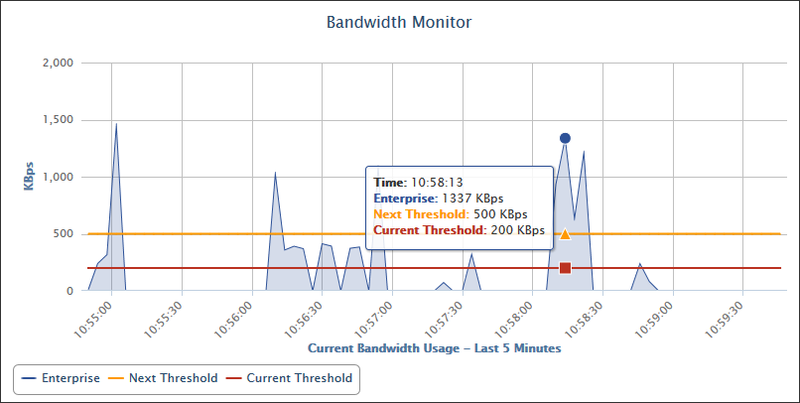 The Bandwidth Monitor can be accessed by going to Reports – Real-Time Monitor – Bandwidth Monitor. PAC File URL Bypass (Proxy and Appliance Only). The PAC file now has the ability to check the full URL for bypassing over just the domain.